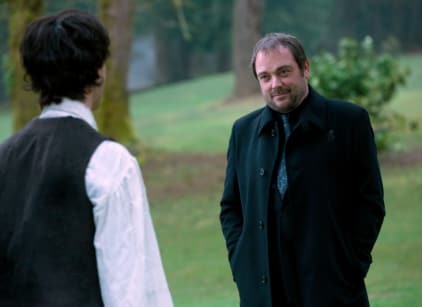 Abaddon captures Crowley's son from the past and uses him to convince Crowley to join her side and bring Sam and Dean to her. Crowley gives Dean the keyword that he is in trouble, but Dean fails to mention it to Sam. Dean goes in by himself to face Abaddon, and after some resistence, kills her. Sam tells Crowley that he has to send his son back, but Crowley refuses. Sam tells Dean they should put the First Blade away, but Dean says no. Castiel captures an angel in an effort to find Metatron. 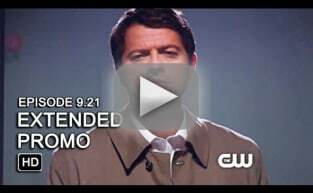 He speaks with Gadreel in the hopes that he will help turn on Metatron. That's the problem. See, you don't think anybody's lying. I think everybody's lying. It's a gift. Supernatural Round Table: "King of the Damned"
Supernatural Promo - "King of the Damned"